…as long as you never need any customer service. I have been largely happy with my 47″, Westinghouse HDTV, however, for the past six months or so, it has had issues talking to both of my PS3s (yes, two of them). Frequently, while displaying anything (DVDs, Blu-Rays, PS3 games, PS2 games, PS1 games, anything), the screen will just go blank. At this point, it’s a flip of a coin as to whether or not the picture will come back. The only solution is to unplug the HDMI cable and reattach it. Since, as you can see, those articles are dated as early as 2006, so I thought that there was a good chance that the problem had been fixed. So I go to make sure that I have the latest firmware on all concerned devices. I check for updates on both PS3’s and find that they are up to date, and I search for a way to update the firmware in the TV. I find that my TV has the “5110_1.1.0 april 13th 2007” firmware installed and that many people on internet forums claim that a version 1.3 of the firmware has fixed their issue. 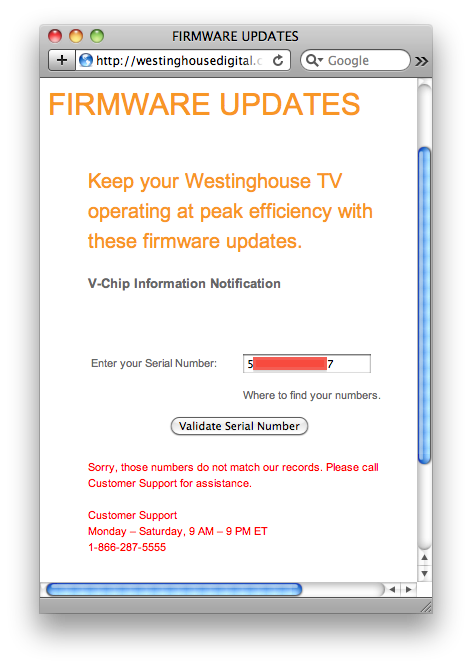 As I don’t really want to download firmware from an untrusted third party (namely some anonymous guy on a technology forum), all I have to do is head to Westinghouse’s site, download the newest firmware, load it onto a USB key and transfer it to my TV, right? wrong, oh so wrong. We apologize for any inconvenience in awaiting our response; we’re happy to assist you in any way we can. You can try updating the firmware for the TV if you are using an HDMI input. Also PS3 has released a firmware update to work with our TV’s. If you have any further questions, you may contact us through email, or by calling us toll-free at 1-866-287-5555, between 9am and 9pm Eastern Standard Time, Monday through Saturday. One of our technicians will assist you. And thank you for your quick response. We apologize for any inconvenience in awaiting our response; we’re happy to assist you in any way we can. You can try updating the firmware for the TV if you are using an HDMI input. Is there a direct link to a file I could download to a USB key? Also PS3 has released a firmware update to work with our TV’s. I believe that I already have the latest Firmware on my PS3, but I can check when I get home. Do you happen to know which version of their firmware addresses compatibility with your TV’s? We apologize for any inconvenience in awaiting our response; we’re happy to assist you in any way we can. The message you are receiving indicates a firmware update is not currently available on our website for your product. I’m sorry for any confusion regarding that. You may also want to try updating the firmware in the Playstation to help resolve the issue you are experiencing. We apologize for any inconvenience in awaiting our response; we’re happy to assist you in any way we can. The message you are receiving indicates a firmware update is not currently available on our website for your product. Someone really should fix your website in that case (i.e. it should actually display a message to that effect, instead of the “Sorry, those numbers do not match our records.” message). Additionally, I find it hard to believe that firmware built over two years ago is the latest firmware (especially since I see people posting on message boards about a version 1.3 firmware for the TX-47F430S). I’m sorry for any confusion regarding that. You may also want to try updating the firmware in the Playstation to help resolve the issue you are experiencing. I’ve verified that my PS3 already has the latest firmware (i.e. 2.70). This essentially makes my TV useless for virtually all of my HD content (i.e. my PS3 is my BluRay player). I can connect through component cables, but then I get some pretty obvious ghosting on the screen in high contrast areas (to the point where my not–technically-minded wife said, “Wow, that looks like crap”). What are my options at this point? We apologize for any inconvenience in awaiting our response; we’re happy to assist you in any way we can. If the unit does have a firmware update and is not showing one currently available, it may have been taken down for maintenance. If a firmware is taken down we will post it again as soon as possible. Is this issue happening on any other HDMI sources? and is not showing one currently available, it may have been taken down for maintenance. If a firmware is taken down we will post it again as soon as possible. Is this issue happening on any other HDMI sources? Westinghouse TV, and neither of them exhibit it with my Samsung TV. On Monday, June 15th at 7:00 AM Central Time Westinghouse Digital Electronics opened its new state of the art Customer Service Call Center. The new call center is designed to allow us to provide you with the service that you are accustomed to when dealing with the Westinghouse brand. Over the past couple of weeks we have done our best to address our customer issues as they came up, but we realize that we may have missed connecting with a few of our valued customers along the way. We want to ensure that we have provided service to all of our customers; therefore, we are reaching out to you to ensure your need for service has been addressed. If we have not yet had the chance to work with you, please contact us at our new service center by calling 1-800-701-0680. Our service center is open from 7:00AM until 7:00 PM Central Time, Monday through Friday. Or feel free to email us at service@westinghousedigital.com at any time. Our goal is to return your email inquiry in 24 – 48 hours. We would like to thank you for you patience as we transitioned to our new call center and we look forward to providing you excellent service in the future. I sure hope not. The “service that [I am] accustomed to when dealing with the Westinghouse brand” is being ignored. Over the past couple of weeks we have done our best to address our customer issues as they came up, but we realize that we may have missed connecting with a few of our valued customers along the way. I don’t feel very valued. My question has gone unanswered and my issue unaddressed for months now. And, since then? Nothing. While I generally like my TV, I will never be buying another Westinghouse TV again. You can simply not trust that they will stand behind their products. Please provide an email address or phone number where we can have an engineer reach you. What we will need is the part number (TW #) in order to be sure you have the right firmware update. I can be reached at clark@clarkcox.com, as well as 408-533-8174. Geeez, what a run-around you have received, Clark. I really feel sorry for you – having been “there” with many manufacturers over many years. Today, I try not to get so involved with details, and try not to become so emotionally involved. Sometimes we just get scr**ed on a product and recourse is extremely difficult and involved – if available at all. I too. have the same Westinghouse TV, and while it has pretty much worked adequately, the sound system firmware is not very functional. In fact I just called again today, and the “firmware is still in progress”, heh-heh, right! So we will call about once a month, hoping that that it might eventually be ready. And in response to “David”. Are you a Westinghouse rep? Would love to have some support after nine months…. Hmmm the issue here is at the begining of May Westinghouses Service Provider stopped taking calls and responding to emails for a few reason the lack of comunication that you all have gotten from the service center is in direct result of Westinghouses Offices not responding to request to get issues resolved and also due to none payment of services for 90+ days. first off. former tech, wow. i can’t even read ur post. its like one big run-on sentence with words missing all over that would help it to even make sence what you are saying. second, i am having a similar issue with my westinghouse tv. its a 26″ LCD TV i use as a pc monitor, ps2 screen, & regular tv screen. its a model SK-26H730S, Part # TW-55807-C026C. it worked fine until i installed a blu-ray drive into my pc. then the blue would start to play & a few seconds into even the start of the menu loading it would freeze the screen. at first i thought it was the blu-ray software, so i un-installed/re-installed the software three different times (each time going through my entire system to make sure all traces were deleted). bought new cables for my pc to my tv (even though i had the right DVI to HDMI, & DVI to VGA cables). finally i took my pc over to my friends, hooked it up to his 19″ LCD HD pc monitor & it worked just fine. i brought it back hooked it up again & still having the same problem. a few forums i have been to said that a firmware update would fix it. but i went to the westinghouse website & got the same message as clark cox. i registered it & still have the same message. does anyone know anything that could help? None of the solutions proposed by Westinghouse have helped, I’ve come to the conclusion that my PS3 will never be able to get a reliable HDMI signal into my TV, and stand by my assertion that I will never again buy a Westinghouse TV. I finally broke down and got an HDFury2. It is essentially an HDMI-to-VGA or an HDMI-to-component converter. I run the HDMI from my PS3 into it, and then connect to the VGA port on my TV. Thank god for the analog hole. Why won’t you just try downloading the third party patch? Many people out there are smarter than you and can program and fix problems. Just look into the patch more and be sure it’s legit. Sorry. There is no way that I’m going to download a firmware update for an appliance from random anonymous strangers on the Internet. I need new firmware too. Any idea where I can download it?